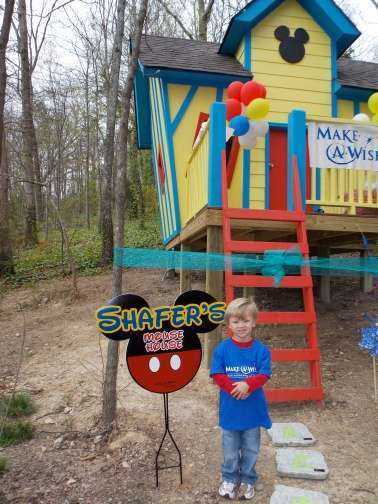 After several months of excited anticipation, on Monday, April 8th, Shafer cut the ribbon for his Make-A-Wish reveal party. 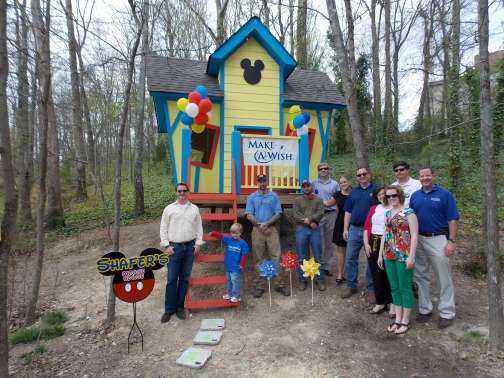 His dream of having a Mickey Mouse Treehouse was now a beautiful reality. The weather was absolutely perfect for his special day. 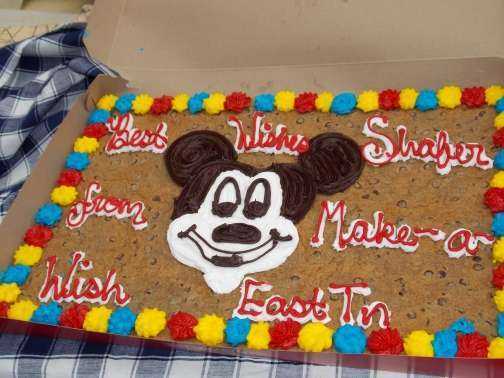 The East Tennessee chapter of the Make-A-Wish foundation provided a Mickey cookie cake, balloons, and lots of decorations and surprises inside for Shafer to enjoy with his sisters and brother. 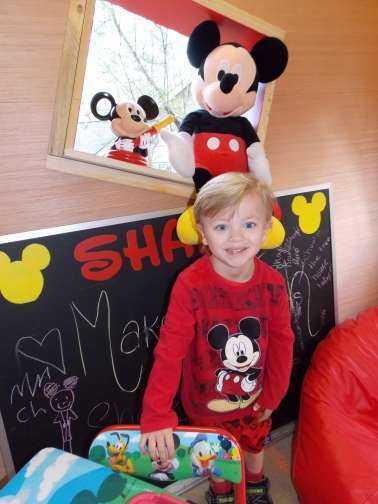 It was one of the most memorable days of my life…filled with many tears…representing both the joy of the gift to our miracle child and sadness from the realization the he is in fact diagnosed with a medical condition that qualifies for a wish. 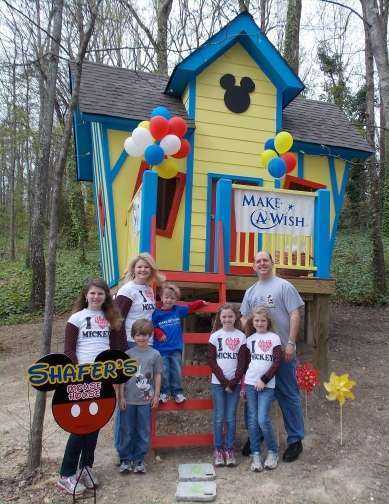 We are so incredibly thankful for the entire Make-A- Wish team, Aztec Industries who sponsored Shafer’s wish, the Strauss Company who managed the building project, and all the other organizations, retailers, and subcontractors who so generously gave of their time to bring this to fruition. 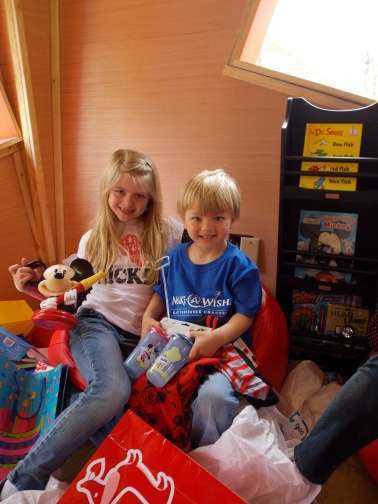 Days now begin and end in the Mickey Mouse Treehouse. 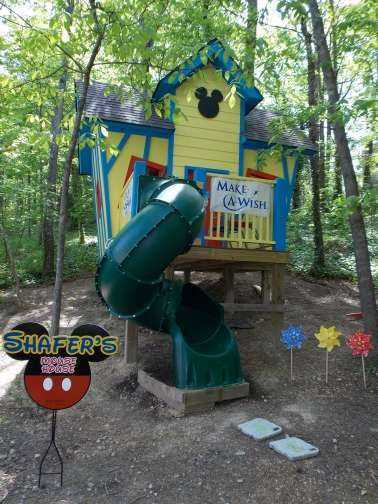 Not only does Shafer love playing in his dreamland, his brother, Shaw, and sisters Shanel, Sharayah, and Shayli equally enjoy it. They really look forward each week to Sunday afternoon naps in the loft and they have spent many days doing their homeschool work there. We’ve had lots of celebrations this month. On April 2, Kevin and I reflected on 19 wonderful years of marriage. It is hard to believe that we have been married that long. As the old saying goes, “Time flies when you’re having fun!” We were able to enjoy an evening out to dinner and great conversation. It is refreshing just to have a chance to share my thoughts with Kevin and to think out loud about our future. How blessed we are to have the privilege of raising five little angels! Even though we loved the first 7 years of our marriage flying solo, we can’t imagine ever going back to that now. Life is now full of nonstop fun and chaos. We are both in agreement that our children have made us better. And marriage has definitely made me a better person. I praise God daily for allowing me the honor to be Kevin’s wife. He is a wonderful husband and even better daddy to our children. Watching him care for Shafer and all of his special needs has deepened my love for Kevin exponentially. 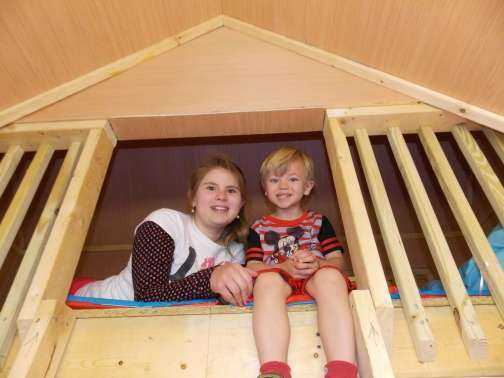 While many men fly the coop under the adverse circumstances that dealing with a sick child brings, Kevin’s love and attention to our family has only grown stronger. He has tirelessly administered medications and boluses multiple times a day, primarily taken care of setting up and handling Shafer’s 8 months of dialysis, his nightly tube feeds, ordering and picking up all his medications from various pharmacies, on top of bathing him most of the time and changing thousands of diapers! Words cannot describe my appreciation for my precious husband, my soul mate…my best friend. On April 15, I turned 43! Yes, I am a tax baby, so it’s always a double celebration each year when the day arrives. 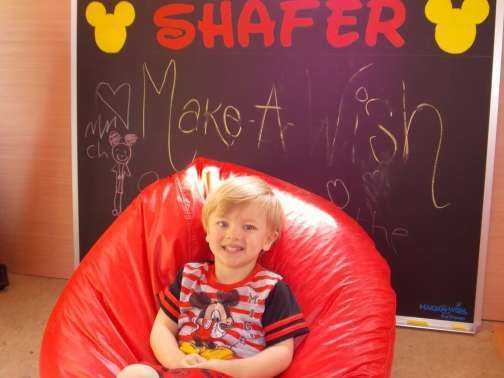 I just love to hear Shafer say, “Let’s get this party started!” He so enjoys decorating with balloons and getting to eat cake and open the presents. It really doesn’t matter whose party it is or what’s being celebrated, Shafer thinks it’s his party and he wants to tear into the gifts. 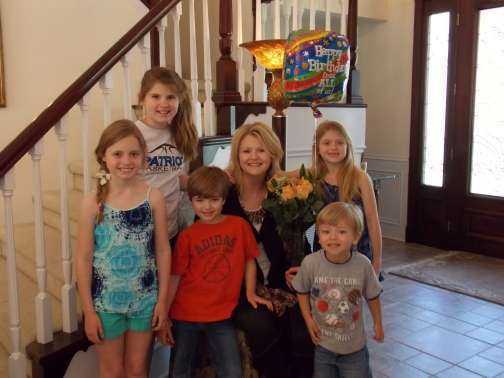 What priceless memories of the kids and Kevin surprising me with a beautiful bouquet of roses and balloons this year as I came in the door from a business meeting. It is truly the little things that make life have such special meaning. As I’ve said over and over through this blog, our lives are filled with crazy good and crazy bad. 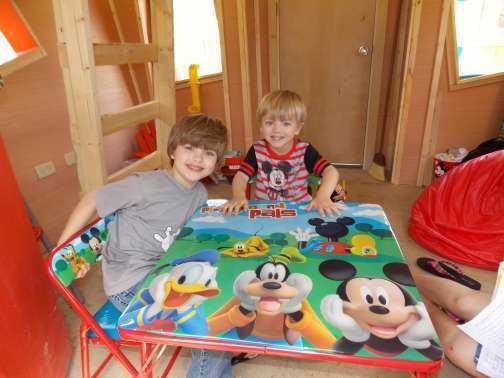 We were having such a long span of good health for Shafer…and then on April 23, everything suddenly changed. 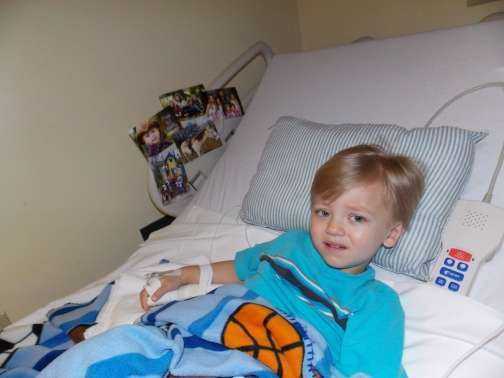 He began to run a fever and it continued to climb to almost 105. Over the course of just a few hours, Shafer was unable to sit or hold his head up or even open his eyes wide. Vanderbilt wanted us to get him to the hospital immediately, and after a few hours at T.C. 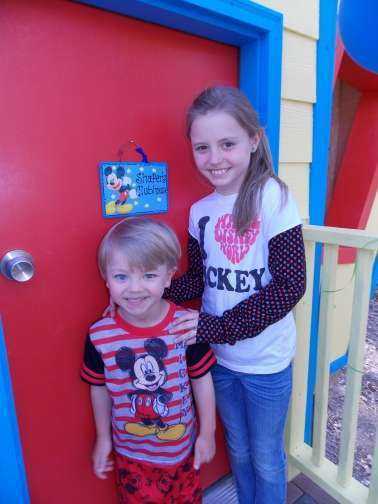 Thompson’s, the diagnosis was clearly seen on the chest x-ray—bacterial pneumonia. We were shocked. It had not crossed our minds that he could have pneumonia, since he had never had it before. 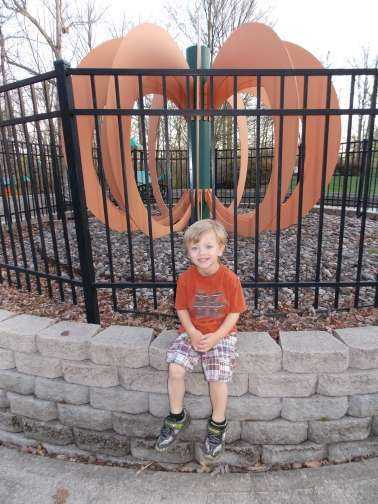 It was hard to believe that he was given this diagnosis only a few hours after getting the call from the pediatrician that his 3rd C-Diff test was positive. It’s difficult to deal with one infection, much less two incredibly serious infections at the same time. IV fluids and antibiotics were administered and over the course of the next two days, we saw Shafer come back to life. We praise God for modern medicine and lots of prayers that provide hope and healing time and time again for our little fighter. We have an exceptional team of physicians who care for Shafer, but if it were not for your faithful prayers, Shafer would not be with us today. He is truly a miracle from the Lord and we are so indebted to each of you for your love, concern, and support.